You will be given a reference e-book to read which has 910 pages And the test will be based on that e-book , you can take final test within 1 year of purchase. Being a certified professional in forensic science is now possible and more convenient with the help of the forensic science certification program offered by Brainmeasures. With the help of the forensic science course from Brainmeasures, you get the chance to learn not only the vital aspects of forensics but also some of its most complex topics. Enrolling in this certification course gives you the opportunity to receive the most comprehensive forensic science training and this is a major help in your attempt to effectively handle investigations on a specific crime. The knowledge and skills that you will get from the forensic science certification program offered by Brainmeasures are highly reliable and accurate enough that you will no longer find it hard to deal with the other investigators and present your evidences to the court. 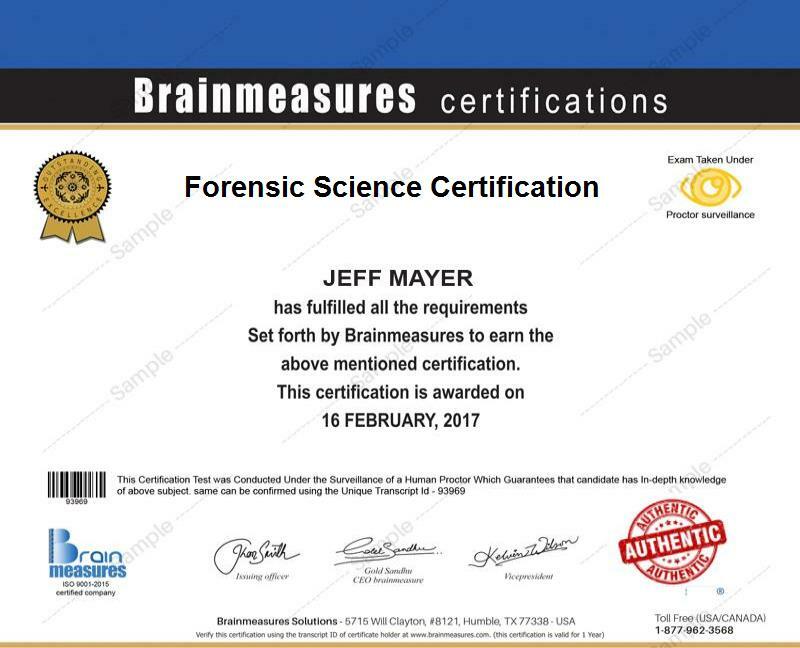 Before Brainmeasures will supply you your hard copy certificate, you need to be able to pass its forensic science exam which will serve as an effective evaluation of your knowledge and skills in the field. The forensic science certification program which is now available at Brainmeasures is a major help for a lot of individuals especially those who are responsible in investigating crimes. It is most suitable for forensic technicians and scientists who are greatly passionate about the future of forensics, policy makers and forensic managers who want to start dealing with forensic scientists and judges, lawyers and any other professional working in the legal industry who wish to gather information about the issues that are now encountered by forensic science as well as the effectiveness of this subject in expertly gathering evidences and detecting authenticity of testimonies. Completing a forensic science certification course is also a major help if you have longed to significantly increase the level of your income. Using your forensic science certification to work as a forensic science technician allows you to earn within the range of $25,000 to $71,000 annually. If you decide to work as a forensic scientist and you are still a beginner in the field, then your average annual salary can go around $44,000. This can grow to up to $73,000 to $91,000 as you gain more years of experience in the field.